International Journal of Bioscience and Medicine (ISSN:2575-7814; DOI: 10.28933/IJBM) is a peer reviewed open access journal publishing research manuscripts, review articles, editorials, letters to the editor in the area of Bioscience and Medicine. International Journal of Bioscience and Medicine(ISSN:2575-7814; DOI: 10.28933/IJBM) is a peer reviewed open access journal publishing research manuscripts, review articles, editorials, letters to the editor in the area of Bioscience and Medicine. Professor&Director of Student’ Affairs, The University of Bamenda; Department of Pharmacotoxicology and Pharmacokinetics, Faculty of Medicine and Biomedical Sciences, University of Yaoundé 1. 1.Kaouthar Samarat, Sho Hanida, Shigeru Ishikawa, Kazunori Kotani, Teruo Matsuzawa. Computational Fluid Dynamics Simulations of Chimpanzee Nasal Airflow for Different Respiratory Modes. 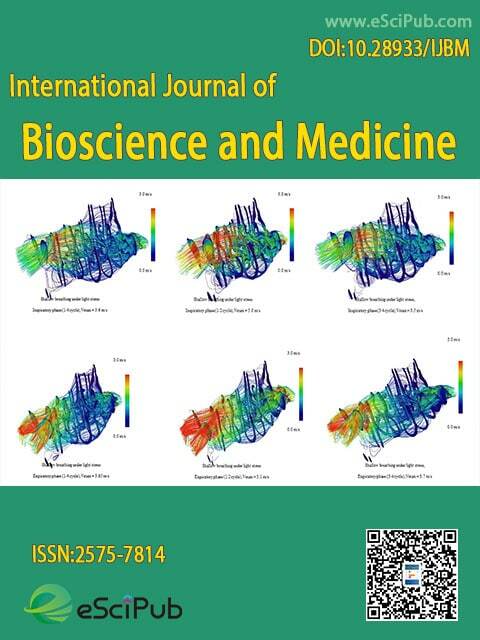 International Journal of Bioscience and Medicine, 2018; 2:8. DOI: 10.28933/ijbm-2018-06-2001. International Journal of Bioscience and Medicine is a peer reviewed open access journal publishing research manuscripts, review articles, editorials, letters to the editor in Bioscience and Medicine (Indexing information). Please submit your manuscript by the form below or send it to IJBB@escipub.com.